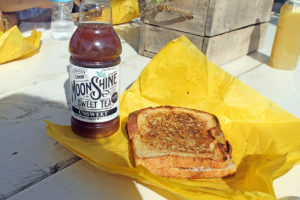 If you’ve been reading my posts lately, you know we just returned from a week in Texas! 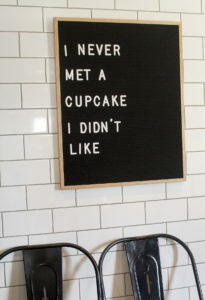 Yesterday I shared our food experiences while we were in Austin (click here if you missed it)…today it’s all about food trucks, cupcakes, and burgers in Waco! 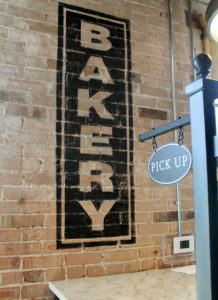 So you can’t go to Waco without visiting Magnolia Market at the Silos! 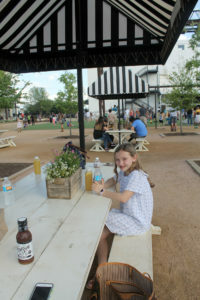 We actually spent an entire afternoon there…even eating two meals (lunch and an early dinner) from the food trucks. 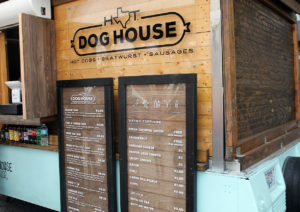 Hot Dog House…When you have a family of five, everyone has different preferences when it comes to food. 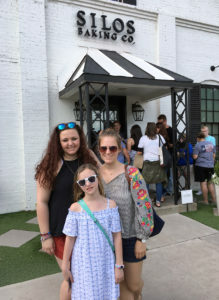 After arriving at Magnolia at lunchtime, my older daughters headed off together to find something they would like. 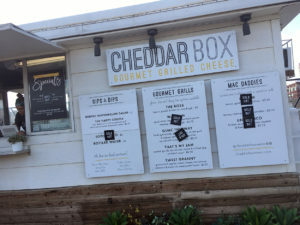 Rather than stand in two (or three) different lines, we decided to go to this hot dog food truck because we knew they would have something our youngest would like. While I’m not a big fan of hot dogs, I thought the Demo Day Dog (love the name) looked interesting…Dr. 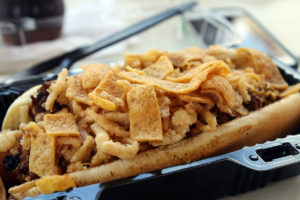 Pepper chili, cheese, bacon, and crispy onions topped with Frito chips! Remember, we are on vacation…calories don’t count! It was so loaded with toppings that I used my knife and fork to eat it, but it was very flavorful. 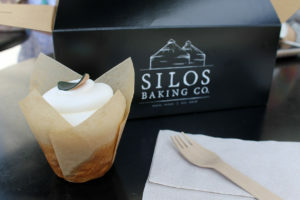 Silos Baking Co…Well, you can’t go to Magnolia without indulging in one of Joanna’s cupcakes! The line was looong, and we were told that it would be a 45 minute wait…but we didn’t come all the way to Waco without getting a cupcake! It was actually about a 30 minute wait, and the line moved quickly. 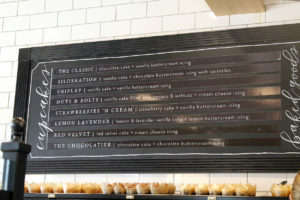 They even give you a small card with a menu on it while you are waiting, and you write your order on it so you are ready when you reach the counter. I thought that was pretty efficient! 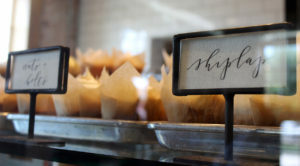 Now for those cupcakes…I went simple and ordered the Shiplap Cupcake (thought it went well with my Demo Day Dog). 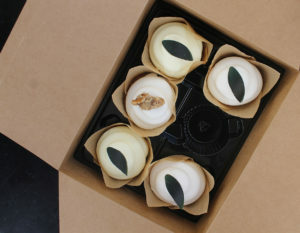 It is a vanilla cupcake with vanilla buttercream frosting, topped with an edible magnolia leaf. So rich and creamy! 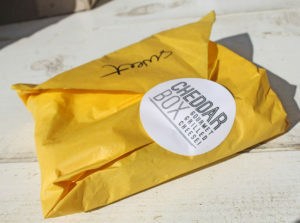 Cheddar Box…After exploring more of Magnolia and the city of Waco, we decided to go back to the food trucks for an early dinner (since they close at 6:00). There were so many food options, we wanted to try more! The line for this place was so long at lunch that I wasn’t surprised that most of the items were “sold out” when we went back. I wanted the Sweet Granny,” as did my oldest…so with one left, we decided to share it. This gourmet grilled cheese sandwich is made with Granny Smith apples, cream cheese, cinnamon, and honey on sweet potato bread. YUM is all I can say! 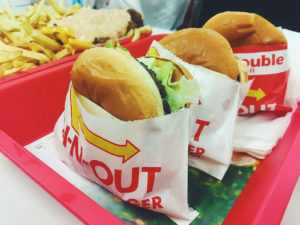 In and Out Burger…Now, I know what you are thinking…”In and Out isn’t a locally-based restaurant.” You’re right, it is based in California (we actually ate at one outside of Palo Alto a few years ago) However, we don’t have any in Ohio and when those munchies hit us later in the evening after our early dinner at Cheddar Box, we headed out for a burger. That special sauce of theirs adds just the right flavor to the meat! 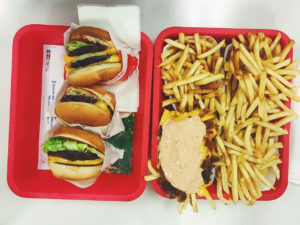 My vegetarian daughter tried fries topped with the sauce…no burger for her! And that ended our food experiences in Waco!